Surely, no one would think of “charging” a fee to hear the Gospel, would they? In these days when many congregations are finding their attendance and offerings slipping, it’s the kind of thing a church council member might suggest. A user’s fee! We all know that the Gospel is to be free of charge. Of course, St. Paul is talking here about his right to financial support from the congregations he’s serving. He has no reason to boast of his apostleship, but he does have the right to expect some form of support. However, Paul refuses financial support from the Corinthians. He wants to make his preaching of the Gospel free of charge! Isn’t that what we want as well? In Luther’s time (and before), people regularly viewed collections of relics—a supposed bone of St. Peter, a reputed lock of the baby Jesus’ hair, etc. It was believed that by making a financial contribution and perhaps offering prayers at each relic, one could shorten their time in purgatory and get into heaven more quickly. One of the largest collections in Europe was at the Castle Church in Wittenberg, Germany, where Dr. Luther was a professor at the university. The most common time for parishioners to visit the church and view the relics was on All Saint’s Day, November 1st. No wonder, then, that Luther nailed his 95 Theses on the door of that very same Castle Church on the Eve of All Saints Day, questioning the very practice of being able to “earn” salvation. Luther knew full well that there would be crowds of Christians coming to the church on that day—so that his Theses would make a statement. And what was the statement? Is the Gospel free of charge, or can we earn our way into heaven through offerings, or good works? 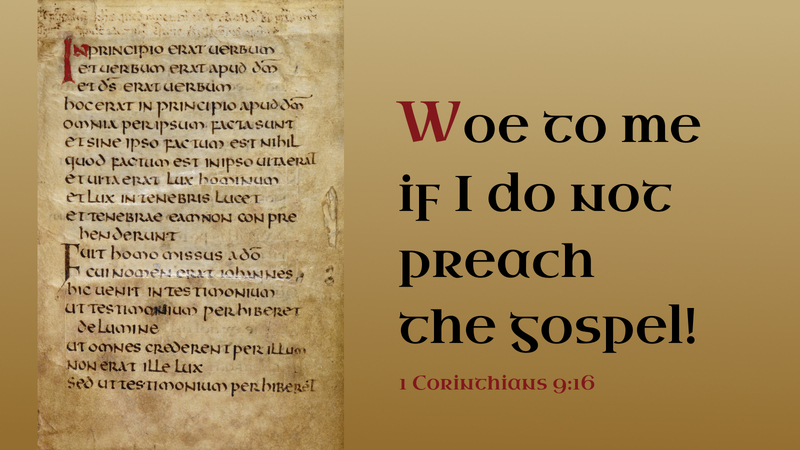 Woe to us if we do not preach the Gospel as God’s free gift of grace! Prayer: Almighty God, by your free grace and favor, make us bold to preach the Gospel, that all may come to salvation by faith in Jesus Christ. Amen. Being a missionary, we have also felt the sting of the church coffers. As independent missionaries, we hear of what is happening inside the churches. Some have suggested cutting out the mission budgets, like that will help you to grow. A Southern Baptist congregation that is very generous to us, said that the Southern Baptist Convention had to pull one of their missionary families out of the field because they were not raising enough money to support all their missions. We however are very grateful to all those who keep us as a mission. We praise God for those in the NALC who have decided to support us. Blessings to all who continue to support their local congregations and their pastors.